1.) Hats are perfect shields for your hair from the sun's brutal heat especially if your on the beach perfecting your tan. Large brimmed hats allow you to throw a little shade in style! If you aren't a hat girl try a turban or cute scarf like Solange! 2.) Due to increased sweating during the summer from heat try using a dry shampoo to clean your scalp while wearing your installs. We recommend our Indique Essentials Dry Shampoo, which helps to cleanse your scalp in between shampoo services. 3.) Try protective styles that help protect your natural hair such as high ponytails and top knots. They are also great to help keep you cool during heat waves! Indique Loves Moms! Get 15% off now through May 9th! In celebration of Mother's Day, we're having a SALE on all your favorite INDIQUE Collections! From Wednesday, May 6, 2015 to Saturday, May 9 2015, receive 15% off your purchase*! *To receive this discount on the SEA Collection, two tubes or more must be purchased. Offer ends at close of business at Indique Boutiques and 11:59pm on indiquehair.com on May 9, 2015. Discount amount cannot be combined with any other discount or offer. Discount not available to Partner Stylists or Authorized Retailers. Offer excludes T3 products. Learn how to do Braidless Installations with Jamal Edmonds! Join us at Indique Silver Spring with Indique Partner Stylist Jamal Edmonds where he will demonstrate his braidless sew-in techniques using Indique Hair! Prom season is upon us! So before the stress and anxiety kicks in we want to help ease your pain. When opting for an updo you begin to think you're stuck with it. Thanks to our Fishnet Clip-Ins your versatility options are endless. So after prom night you can have fun and let your hair down literally! Our fishnet clip-ins are available in Wavy, Straight or Curly. 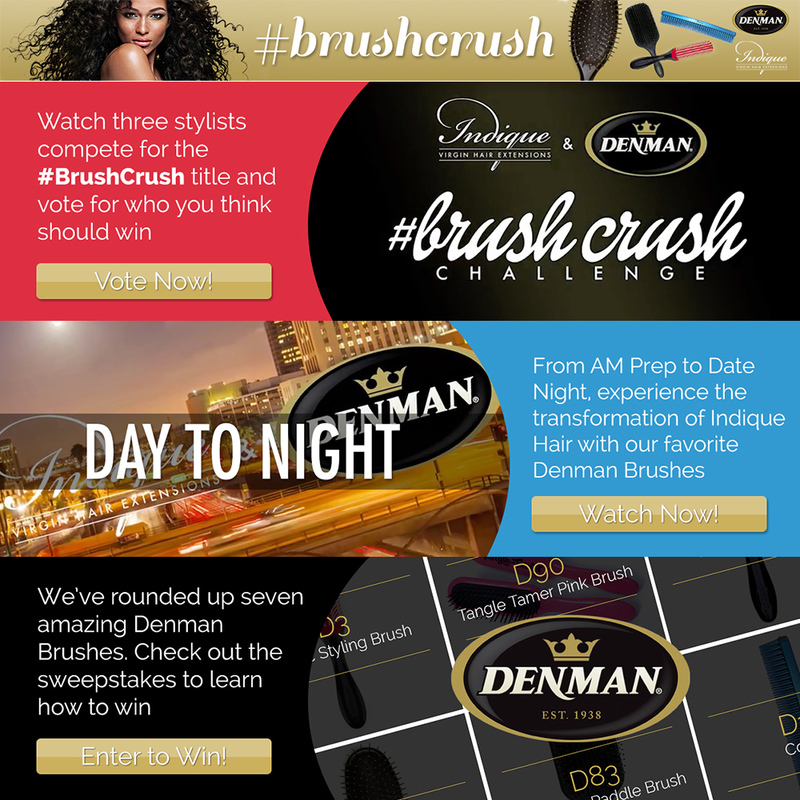 Indique Hair & Denman Presents: #BrushCrush Challenge! Indique and Denman invited three stylists to participate in a three round styling challenge (timed) held at Atlanta's top salon, Melrose & McQueen, where they had to use a Denman Brush and specific tools to create the designated look. Salon Owner & Educator, Kristo, helped to bring their sketches to life. Watch the challenge, vote for your favorite contestant, learn more about Denman brushes and enter to win a Denman brush set of your own using this link. Explore Black Hairstory with Indique! Watch how African American hair has transformed form the 1920s to present day! Narrated by Co-Founder & Creative Director of Indique Hair, Ericka Dotson. Every year, celebs from all over come out an support amfAR's all red fashion show. amfAR plays a vital role in AIDS research, identifying critical gaps in our knowledge of HIV and AIDS, and supporting groundbreaking studies that often lack the preliminary data required by more traditional funders. This year, Ciara showed out! Wearing 30" of PURE Wavy styled by Celebrity Hair Stylist- Cesar Ramirez, Ciara was radiant in red! In Celebrities , charity, Fashion, Hair Tags amfar, ciara, cesar ramirez, indique hair, pure wavy 30"
Indique Featured on Hype Hair! Wondering how to achieve Zendaya's larger than life American Music Awards look? Hype Hair has all the details! Christmas is less than three weeks away and we have the perfect gift for the Indique'Nistas out there! Sephora's Gold Star Dual Brush Set ($25.00) is sweet and chic for those who like to switch up hair styles often. This comb and brush set makes the perfect stocking stuffer wouldn't you agree!! K Michelle's- "Anybody Want to Buy a Heart"
In honor of our Indique Fave K Michelle, we are offering our Indique Atlanta clients 10% off of their purchase from now till January 4, 2015! Use the code INDIQUEATL at our Atlanta Boutique from now until January 4,2015. Check Us Out on Styleblazer.com! We were featured on Styleblazer.com as on of the top 10 natural hair extensions brands. Check out the article here! Lower lighting is the hair trend that never seems to end. This year take it up a notch with "Sombre Highlights." Unlike Ombre highlights Sombre highlights mimic a faded look with highlights added around the face and a much more gradual descent into a brighter shade of your natural hair color. The more polished look is awesome for redheads, blondes and brunettes. It also ideal for taking your summer hair into winter. Try a closure. If a blonde bombshell or daring redhead are in your future hair fantasies, try using a closure to achieve this look. Keep the roots dark and gradually extend your color. A closure allows you to protect your own hair underneath making blending an easy task. Try our Hysteria Collection. If you want to protect your virgin tone bundles try using our Hysteria collection. Our pre colored options allow you to enhance your install with a pop of color at the snap of your finger! Shawna Love Williams Hosts "Queens & Crowns"! This past Sunday, Indique Queens hosted an amazing style session with Indique Partner Stylist Shawna Love Williams! She specializes in closures and transformed her assistant wearing Bounce Relaxed Straight in 10” & 12" with a Bounce RS 12”crown closure. The model wore a blonde ombre in which she cut into a short bob with a swooped bang. The style looked absolutely natural and beautiful. We topped the session off with a few raffle gifts, which included essentials and a gift certificate for Shawna services. We had so much fun and everyone left feeling empowered and beautiful. Product of the Month: PURE Wavy 16"
Pure Wavy in 16” is Indique’s Product of the Month for October, 2014! Indique’s Pure Wavy texture is very versatile. This hair can be worn in one length or in layers. The natural wave pattern is simply gorgeous. This hair also holds curls beautifully and flat irons smooth and straight. Pure Wavy has a signature fall pattern that creates effortless movement and outstanding body.